This special project involved developing a custom PHP module for a local, CrossFit box. The password-protected module enabled each member to track his/her progress while participating in the current challenge. This CrossFit box (no longer exists) had a WordPress website that was maintained by a member. 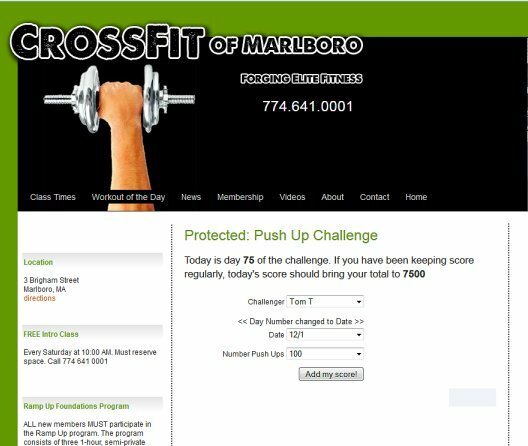 This CrossFit challenge was named 100 Push Ups for 100 Days. Create a screen to display members’ progress, Push Up Contest Progress (page no longer available). Technical: The contest data entry screen was defined in a custom PHP program that was referenced in the theme’s functions file and called into the screen via a shortcode. The built-in WordPress password-protection mechanism was used to control access to the contest data entry screen. The data was stored in a custom table inside the WordPress database, and the contest progress display screen (Push Up Contest Progress) was a custom PHP program, also referenced via the functions file and called into the display screen via a shortcode.